Sixteen short nonfiction works in the public domain, independently chosen by the readers. 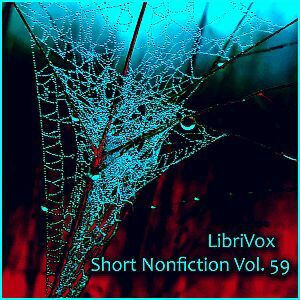 Volume 59 contains an eclectic mix of readings, ranging from a description of a Coney Island elephant colossus to meditations on mental telepathy and baseball. Philosophical essays by Leibniz, Kierkegaard, Schopenhauer, Francis Bacon and William Blake touch on the topics of truth, prejudice, poetic genius, suicide, and preparation for a Christian life. An educator at a women's college in the early 1920's bemoans the decline in the way high school girls dress for school and recommends a "serge jumper dress, made with a washable under blouse." In the same span of years, a female reporter, going undercover to research conditions in the Detroit House of Corrections has herself arrested and is "stripped to the skin and searched for narcotics" and then made to don prison garb: "a faded gingham coverall, prison-made and drab." A medical doctor, writing in the 1870's, examines the connection between clean living and longevity, while a historian discusses how slave labor was employed in the salines of Southern Illinois. Native American Indian speech patterns are explored in an essay on the evolution of language, while a a chapter from a children's science book explains what happens "when the dew falls." Lastly, a spirited defense of the Bodleian as a research institution rather than a circulating library rounds out this volume of the nonfiction collection. Preparation for a Christian Life III was translated by Lee M. Hollander.